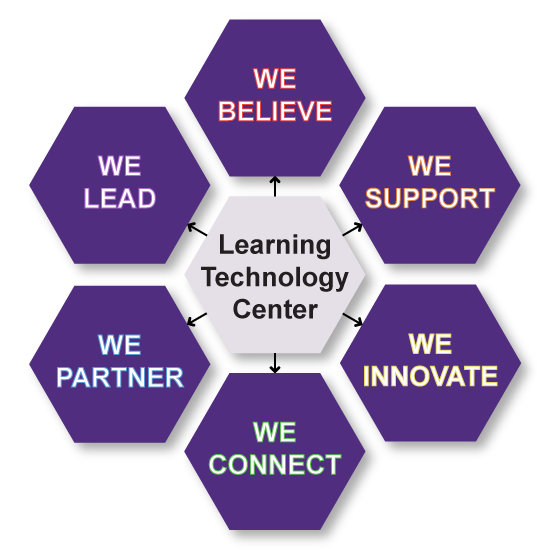 In my first blog post, I shared the LTC’s mission with you, and in my last blog post I talked about how the LTC supports instructors through cutting edge programming with partners (like the LEARN Center). Today, I want to talk about the next hexagon–how we innovate. According to our mission, “we innovate with instructors by initiative emerging technology exploration projects that investigate learning technology trends in higher education and how they may be used here at UWW.” Every year instructors receive a survey from the LTC asking about satisfaction with our services, and challenges they may be having in the classroom. We analyze this data to understand the key challenges instructors are having and merge that with other data from the literature (e.g., key new pieces of research, the ELI Key Issues for Teaching and Learning, the NMC Horizon Report, etc.). Together, these data points drive the tool we investigate. From there, the LTC recruits instructors who would like to use the tool in their classes through an open call and then works with them to learn the tool, implement it into their course, and evaluate its ability to solve the pedagogical challenge that it was selected to solve. From our last instructor support survey we knew that instructors were concerned with student engagement. This semester (Fall 2017), as part of an emerging technology exploration project, we have ten instructors who are busy at work using Cisco Spark in their classes to engage students in different ways. 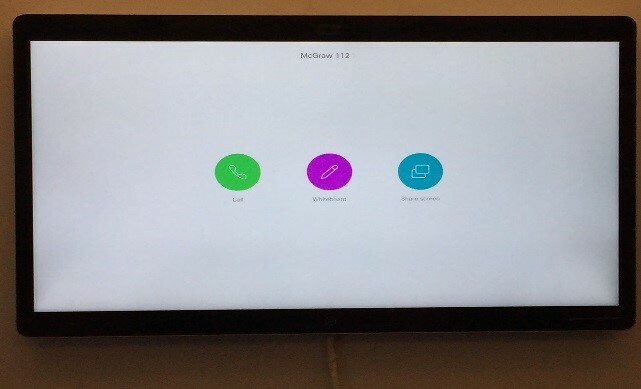 Cisco Spark is a two-part system that features an interactive board and virtual space to increase student engagement through collaboration, communication, and interaction inside and outside of class. Wireless Presentation that enables instructors and students to share content and collaborative work. Electronic Whiteboard that allows instructors and students to illustrate course concepts and return to them later for review, editing, and further conversation. Web Conferencing that creates a 4K video calling experience with intelligent tracking. Perfect for bringing in guest speakers! Interaction does not stop with the Interactive Spark Board. Instructors and students can leverage the virtual Spark Space to interact and continue class activities. Access to the Spark Space can be gained from mobile devices (such as tablets), laptop or desktop computers, and through web browsers. 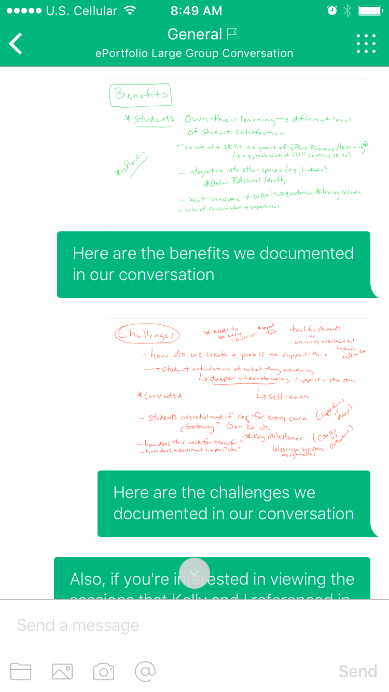 Instructors can create a class space for course questions and further divide their space for specific discussion, group project work, or activities started on the Spark Board. Look for findings related to this project in Spring 2018! If you have any questions, please contact the UW-W Learning Technology Center. What Does the LTC Do? As you settle into the Fall semester, I wanted to take a few moments to share the (relatively) new LTC mission with you. We are widely known for our support of the learning management system, D2L, and the work we do with instructors to help in the design and redesign of courses for the online and blended environments. We are incredibly proud of the work we do in these areas, but in my first blog post I thought I would share our mission as a whole to give you a sense of some of the other things we do in the LTC. WE BELIEVE in integrating pedagogy and technology to assist instructors in developing effective learning experiences. We do not believe in using technology for technology’s sake or because it is the latest fad. Instead, we believe in understanding issues, discussing a wide array of possible solutions (both technology-based and not), implementing strategies, and evaluating their effectiveness. WE SUPPORT instructors in their pursuit of excellence in teaching and student learning through offering quality services, timely assistance, and cutting edge programming that work to help instructors to explore, design, implement, and evaluate evidence-based teaching and learning with technology strategies that aim to increase student engagement and success. WE INNOVATE with instructors by initiating emerging technology exploration projects that investigate learning technology trends in higher education and how they may be utilized here at UW-Whitewater. Further, we conduct research studies around the learning technologies that mean the most to our instructors, students, and institution. Results from projects and studies are disseminated within our institution and beyond, further solidifying UWW’s reputation as a leader in creating transformational educational environments and implementing innovative programs that support success for all students. 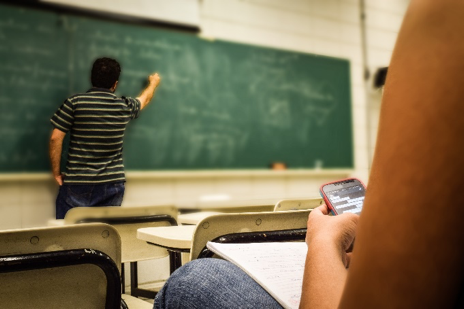 WE CONNECT people on campus and beyond who have the same interests and are doing the same things to create community among instructors who teach with technology, spurring widespread sharing of strategies that work in solving common teaching challenges. WE PARTNER collaborate, and communicate with colleges, programs, departments, instructors, and tech-liaisons to understand and meet university instructional needs, providing experiences that are valued by the campus community in regards to learning technologies and student success. WE LEAD learning technology initiatives and extend expertise to campus wide initiatives focused on increasing student access, enhancing engagement, and supporting success, helping them to become critical thinkers, engaged citizens, and educated employees. Guided by an advisory group, made up from instructional representatives from each of the colleges, we value a data-driven approach taken from what instructors report to us in the annual Instructor Support Survey and trends we see in research related to technology, student engagement, and success in higher education. In my next blog installments, I will share information about some of the exciting projects we’re working on in each of these different areas. Stay tuned! 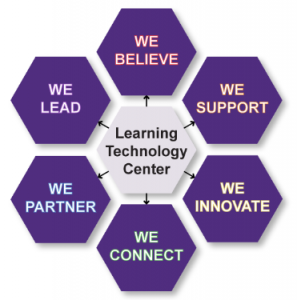 If you have any other questions or comments, please don’t hesitate to contact the UW-W Learning Technology Center. Interested in understanding how student behaviors impact their success in your course? If so, our spring emerging technology exploration project might be for you! 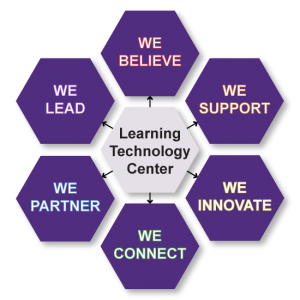 The UW-Whitewater Learning Technology Center (LTC) is proud to announce support for 10 instructors interested in integrating the Study Pattern tool into their spring courses. Study Pattern is an exciting tool that has the potential to empower students in their learning and enable instructors with the information they need to make decisions regarding their course in way that is easy to use and digest. 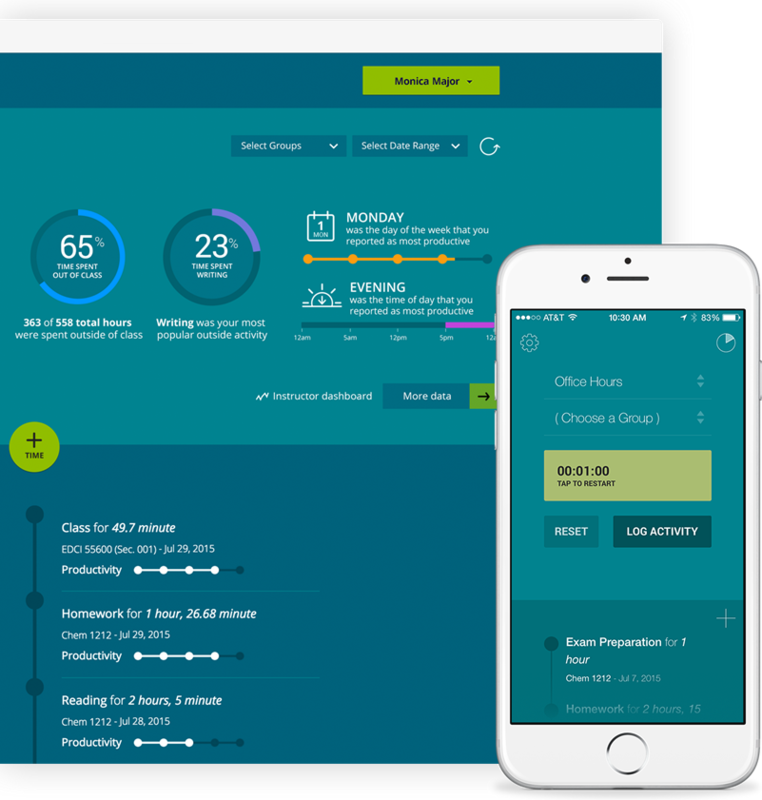 Pattern gives students a space to track their study and learning activities, as well as rate their duration and productivity. Inputting this information creates personalized visualizations of their data and allows them to compare habits with their peers in the same course, empowering them to reflect on the time they are spending on the different learning activities and when they are most productive to ensure they are on the most successful path. At a glance instructors are able to see aggregated student data for their course (e.g., productivity by day of the week or hour of the day, productivity by activity, number of hours spent on course activities, etc.) through their dashboard, enabling them to make data-driven decisions about course activities and design. This tool is easily accessed by students and instructors as it is available through a mobile app (both iOS and Android) and/or web interface. Students can easily use the tool to input their activities and instructors and students alike can quickly view their dashboards to gain valuable insights about learning activities and success. Having students complete an online survey near the end of the semester that gathers their perceptions of the tool in regards to ease of use, usefulness, impact, and satisfaction. Providing information on their experience implementing Study Pattern through personal testimonial, video interview, and/or speaking at LTC event. If you have any questions about this project, please contact the ltc@uww.edu.